Music is all around us and a part of daily life, whether we choose to listen to it or come across it playing in shops or restaurants that we visit. Prehistoric humans had music in their lives despite it not being essential for survival like hunting and shelter. Old bone flutes and many cave paintings of instruments from prehistoric times have been found around the world. Occupational therapy is all about the art and science of living, what we do makes us who we are and music has a lot of meaning to us. We can self regulate by using music so if we need to do household chores we may put on something fast and upbeat, if we want to relax or go to sleep we may play something soothing and slow. Music is also used to distract ourselves, for example when you are kept on hold on the phone or when waiting in a surgery there is often background music playing. Music can also serve as company for us, at work, at home and in the car. It gives us an identity through our record collections and our spotify feed. It often helps to bring memories back or enables us to communicate emotions. It is also an entertainment and is part of every celebration. The presence of music in our lives shows how important it is and how different meaning is incorporated through music. Learning to play an instrument strengthens the synapses between the brain cells which has a positive impact on our sensory and perceptual systems, cognition, gross and fine motor skills, co-ordination and learning memory. All these benefits when we can be having fun, and enjoying ourselves when we are playing our instruments! I am doing a sound therapy course and have had to buy more instruments to complete the course. Purchasing instruments as been great therapy, before the sound therapy even starts! As I sit typing I am surrounded by gongs, crystal bowls, a range of precision, the harps of course, nobody is ever far away from a harp in this house, and the old Joanna – cockney rhyming slang for piano. As an occupational therapist I am approaching sound therapy from a therapeutic activity perspective. As part of my course I have had to learn to play these new instruments and engage my senses with them. Some of the sounds are ethereal. Hearing them for the first time is an incredible experience, and not one that the mind or body first knows how to process as there is no previous experience of it to go on. That’s my experience of it anyway, and what a fantastic experience, the older I get the harder it seems to be able to experience things for the first time. I want to keep my feet firmly on the ground so that does limit my choices, no bungee jumping for me thank you. I find playing the instruments is energising, and having them next to my desk is the perfect antidote for any mid morning or afternoon slump and serves me better than any coffee would. Making music is powerful stuff, and energising activity, why isn’t if on prescription? I am doing a sound therapy course and have had to buy more instruments to complete the course. Purchasing instruments as been great therapy, before the sound therapy even starts! As I sit typing I am surrounded by gongs, crystal bowls, a range of percussion, Himalayan bowls, the harps of course, nobody is ever far away from a harp in this house, and the old Joanna – cockney rhyming slang for piano. As an occupational therapist I am approaching sound therapy from a therapeutic activity perspective. I find playing the instruments is energising, and having them next to my desk is the perfect antidote for any mid morning or afternoon slump and serves me better than any coffee would. I get up and bash a gong for a bit or caress a crystal bowl and hey presto I’m ready for work again. Doing makes me feel good, am I a human doing, and not a human being? No just an occupational therapist who knows the power of occupation, and the necessity to engage in activity that is meaningful to us. As part of my course I have had to learn to play these new instruments and engage my senses with them. Some of the sounds are ethereal. Hearing them for the first time is an incredible experience, and not one that the mind or body first knows how to process as there is no previous experience of it to go on. That’s my experience of it anyway, and what a fantastic experience, the older I get the harder it seems to be able to experience things for the first time. I want to keep my feet firmly on the ground so that does limit my choices, no bungee jumping for me thank you. Sound is energy that we can hear so it makes sense that producing the sound waves is energising. We all have a personal response to sound, and may have associated certain memories with sound and have a different perception of what is music, what is sound and what is noise. Birdsong isn’t technically music, but it is melodic and we like to hear it. It is a sound of an early spring morning. Most of us have only ever experienced a gong sound at the start of a J Arthur Rank Film if we’re old enough. Now gongs are getting more popular and gong baths are popping up everywhere I thoroughly recommend one for a truly relaxing experience. Relaxation is an underrated occupation that we need to invest more time in, so get yourself to a gong bath, leave your smart phone and tablet behind for a while and invest in yourself as recommended by Huffpost and catch one of mine in Southsea soon. 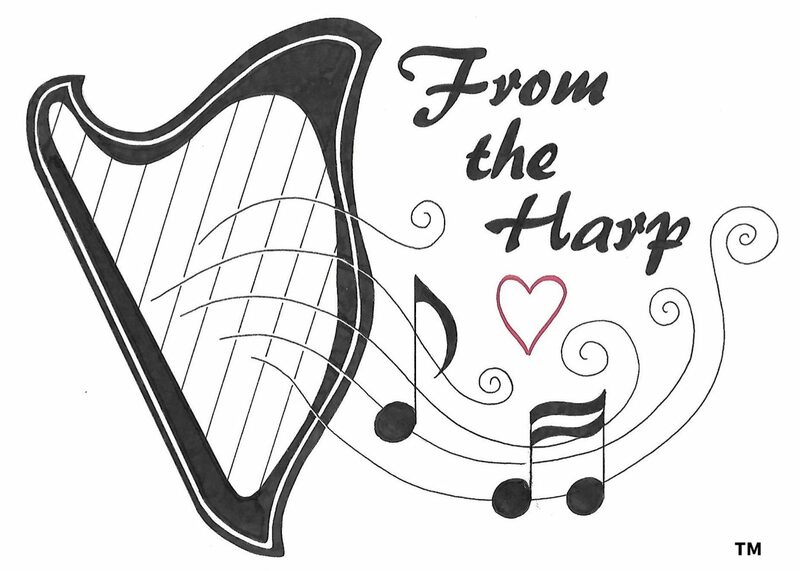 I became aware of harp therapy before I even played the harp or was an occupational therapist. I was fascinated that the harp was being used for healing in health care settings. I realised the benefits for myself when I got my first harp, I found it soothing and found I could use it to reduce my own anxiety when I was feeling anxious or uptight. I recognised my breathing and heart rate went down when I started playing when I was feeling like this. It seems that it was well known in the ancient world that the harp was beneficial for health and healing. In 1500 BC music was a science taught and studied by Pythagoras, music was used to heal the sick, he taught students to use notes, chords, and melodies to induce physical responses in the body. Pythagoras believed that music could change behaviour patterns and accelerate the healing process. In the Old Testament book of Samuel there are 46 references to King David’s use of the harp as a healing instrument. The use of the lyre by King David to help reduce King Saul’s anxiety and anger is well documented in the Old Testament. Harp therapy is well established in the USA, there are a few training programmes, and harp therapists are employed in hospitals and hospices. There is evidence to show that harp therapy can reduce pain and anxiety, and lower racing heart and breathing rates. It seems like we’re relearning the lessons from the past. These days harp therapy is done in hospitals, hospices, nursing homes, day centres, cancer centres, learning disability settings, mental health units and in the community. Therapy harps are small and lightweight, and have a strap so can be played standing and walking around facilities. Smaller harps started to be made around the 1970s and it was at this time the harp started to be used therapeutically. Large numbers of overtones (variety of tones) are produced when plucking the vibrating strings of the harp which produces the resonance and soothing sound that people enjoy. The harp music will be delivered therapeutically to create an individual experience and offer some respite from the routine of the day for the client. The music is made personal at the chair or bedside for clients to support them with whatever physical, mental, emotional or spiritual difficulties they are dealing with. Every interaction with a client is unique and will be suitable for that moment. During a visit a client may watch, sing or hum, have a go on the harp or close their eyes, I respond to the client by doing what seems to be beneficial for them at that time. Harp therapy is not a performance, there is no set pieces to be played. Familiar and improvised music can be used to meet the needs of the client. While playing I observe the clients breathing, body movement and facial expressions and any sounds they may make and tailor my playing. I aim to provide a soothing space for deep rest, provide distraction from health or environment and reduce stress as the body relaxes and breathing settles. Familiar songs can stimulate memory, and provide joy to lift mood. The feedback from clients, family and staff is all positive and the soothing tones defiantly change the atmosphere. I deliver harp therapy to individuals and groups please get in touch with me if you would like harp therapy.